Pakistan has banned Bollywood superstar Shah Rukh Khan's latest movie, Raees, its distributor in Pakistan says. The film, which also stars Pakistani actor Mahira Khan, was scheduled to open across Pakistan on 2 February. The Central Board of Film Certification (CBFC) has not issued an official statement on why it banned the film. However a CBFC official told BBC Urdu one reason was that the crime thriller "depicts Muslims as criminals and terrorists". Some of the scenes were also "offensive to a particular sect", the official added. Shia Muslims in India had objected to action sequences involving an annual Shia religious procession when the official movie trailer was released in December. 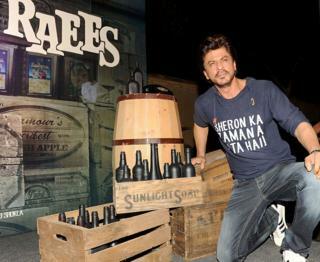 The storyline of Raees revolves around the character of Raees Alam, a Muslim mafia don who builds an alcohol empire in the western Indian state of Gujarat, where the consumption and sale of liquor is prohibited. An official from Ever Ready Pictures, which has distribution rights in Pakistan, told the BBC the film was considered by the CBFC on Friday. They were told on Monday that the board had decided to ban the film. Nadim Mandviwala, who owns the Attrium Cinemas, told BBC Urdu that Raees was a "major film" and that a ban on it "is not good for business, but if the government thinks it may spark religious unrest, then perhaps it's the right decision". However Pakistani film director Jami Mehmood was critical of the decision. "People ought to be tolerant of other people's views. We should watch Indian movies with the viewpoint of the Indians in mind, like Iranian films are watched in the United States." Pakistan imposed a partial ban on importing Indian films after the 1965 war between the two countries and completely banned them in 1971 after the Bangladesh war. The move led to a gradual decline of the Pakistani film industry and brought its once thriving cinema culture to an end. But in 2007, Pakistan lifted the ban. Indian films are hugely popular in Pakistan and are credited with aiding the recent proliferation of multiplex cinemas in major cities. In September last year, however, the Pakistan Film Exhibitors' Association (PFEA) imposed a unilateral ban on screening Indian films after the Indian Motion Picture Producers' Association (IMPPA) banned Pakistani actors from Indian film projects. The move followed a militant attack on an Indian military camp in Indian-administered Kashmir, for which India blamed Pakistan-based militants. The PFEA ban was lifted in December and in February the government cleared two Bollywood productions - Kaabil and Ae Dil Hai Mushkil - for screening.